Skyworks Aerial Systems, a Las Vegas based robotics company, has been around the VegasTech scene for awhile and is gaining more and more momentum. Among other things, they won the 2014 Dominic Anthony Marrocco Southern Nevada Business Plan Competition, took home an award at the 2014 TBAN Tech Nevada Honors, and spoke at LaunchUp Las Vegas in January 2015. Jinger Zeng says she manages the day-to-day operations of the startup, and lead the business development. “I work closely with my CEO on all the high-level business strategies and investor relationships. I also manage our companies’ marketing, PR and sales. I am our very own talented #dronesmith team’s biggest cheerleader, and a community builder at heart who is continually advocating STEAM education (Science, Technology, Engineering, Art and Math) and entrepreneurship,” she said. Skyworks Aerial Systems got it start as a student project at University of Nevada Las Vegas. As a UNLV alumna, Jinger Zeng says she has a huge passion behind the Tier 1 institution initiative for the school. Jinger Zeng says the biggest challenge Skyworks Aerial Systems is solving right now is manufacturing problems that come along with growing a hardware startup. She says being part of the #VegasTech ecosystem has been a benefit to the growth of the company. Skyworks Aerial Systems is kicking off 2015 with ambitious R&D plans already underway. The team is are looking at several great potential joint venture partnerships including work with the Las Vegas Metro Police and Henderson Special Tactics team. 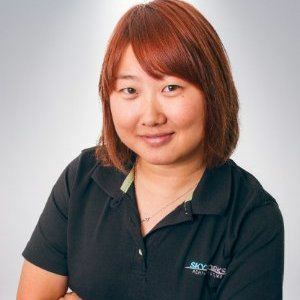 To help Skyworks Aerial Systems grow right here in the Las Vegas community, Jinger Zeng says there are two things the tech ecosystem can provide help with. About Skyworks Aerial Systems: Skyworks Aerial Systems is a hardware development company for small and adaptable unmanned aerial systems (UAS). SkyworksAS is capable of delivering a variety of solutions to both civil and commercial entities that are interested in integrating UAS in their business operations, as well as facilitating educational, research, and development needs for the UAS industry. SkyworksAS multi-rotor copter families are small and versatile. They are designed to adapt to numerous applications including indoor, underground, and/or hazardous flights. SkyworksAS unmanned aerial vehicles (UAVs) have the advantage of modularity, scalability in payload capacity, and optimized manufacturing process as well as intelligent on-board software for flight control and data collection. Pingback: Walls360 Blog » Custom Wall Graphics for Skyworks Aerial Systems Kickstarter Marketing & Rewards!